This slim toilet cistern is designed for concealed fitting within a bathroom with the installation frame built to hang wall hung toilets easily and safely. This concealed cistern and frame is only 90mm in thickness which is the slimmest available, allowing for more of the bathroom to be used as living space. Suitable for installing in front of an existing wall this cistern is so thin it can also be built into an existing timber stud wall which would not impact on any of the bathroom space. The wall hung toilet installation frame is fully adjustable with up and down legs and in and out wall brackets. Choice of 27 designer flush buttons are also available. 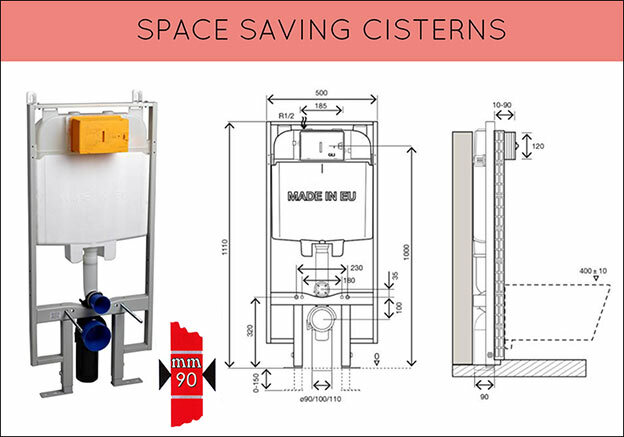 * Space saving slimline cistern. * Will fit in timber stud wall. * Heavy duty 400kg toilet frame. * Maintenace via push button. * 6 & 3 litre flush. * Or 7.5 & 3 litre flush. * 24 dual flush buttons.